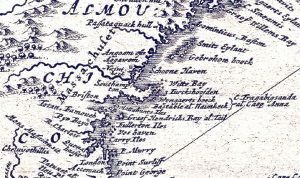 Naumkeag has been translated as “still water dividing the bay” (Nahumbeak) or simply “the fishing grounds” (Na[u]m = “fishing” + keag = “grounds, land, place”). Based on Western Abenaki roots, however, this place name more likely meant “Eel land” or “Here are eels (to fish for)” (Nah(u)m = eels + keak = locative suffix (“here”). Atlantic Eel, a much-prized catch, is a catadromous species that goes from fresh to salt water to spawn and favors smaller rivers and still waters. Eels were eaten as a delicacy, the spine was dried and powdered for culinary use, and the soft strong skins were made into hair ribbons, tumplines, and cradleboard ties. According to colonial accounts the eels grew to great size. Algonquian appreciation of eels was remarked upon by several early observers, including Champlain, Wood, and Josselyn. Though smaller today, they are still abundant in the rivers that empty into Beverly and Salem harbors. The Pawtucket probably called their major village between the Bass and North rivers Nahmkeak, or Nahumkeak. Horsford based his claim on this 1671 map of “New Belgium” by the Dutch explorer, Arnoldus Montanus, in an etching by John Ogilby published in 1673. Wingaerts Hoeck is below Witte (White) Bay, our Sandy Bay. Elizabethan and Tudor English speakers, however, often added an /r/ sound to syllables ending in /a/. Listening to Yankee grandparents, for example, one may hear that Anner had a good idear. Thus the middle syllable in Wingaersheek may have been an Englishism or an error in transcription, and the word more likely is a corruption of a Pawtucket placename in their Abenaki-related Loup language, perhaps something like Wingawecheek. 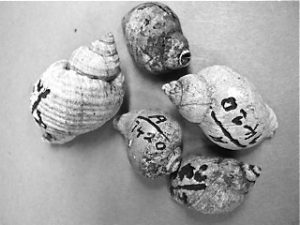 Single wampum beads were made from what we call periwinkles, while several bead blanks could be cut from the cores of channeled and knobbed whelks. The Matz site under Cape Ann Campground was excavated in the 1970s. In the 1940s amateur collectors discovered extensive evidence of long-term Native occupation of the site that became Old Coffin Farm. 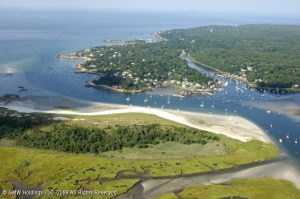 In this view the Jones River Salt Marsh, the site of Old Coffin’s Farm, and Wingaersheek Beach are on the Annisquam River, facing Lobster Cove, Planter’s Neck, and Ipswich Bay. 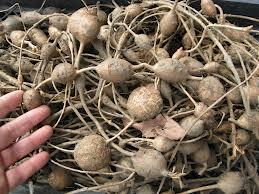 A more likely translation for Pennacook is “Here are abundant groundnuts”. But that’s the challenge with history, it seems: We have to give up what we think we know to consider new interpretations. And we have to look beyond our borders—go over the bridge, so to speak—and Cape Anners will know what I mean by this—to really understand who we are and what’s in a name. We have to go off island to find out how we are part of these ancient places called Agawam and Squam.